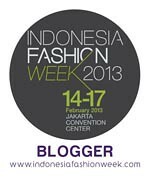 I wore this outfit for Jakarta Fashion Week day 5. I watched 3 shows that day such as LPM Graduates Show, JFW Fashion Forwards (Bretzel, Cotton Ink, Major Minor and Dian Pelangi), JFW Fashion Forwards (Barli Asmara, Jeffry Tan, Albert Januar, and Yosafat). I was wearing black bustier with black maxi skirt. I got it from Pink Label a long time ago, and my Zara shoes. I loved this shoes because of the combination of the colors between black gold and red, and studded clutch from Gowigasa. I loved this clutch too and I had to wait for this clutch for month and a half. This is the first time I wore Red Lipstick, and what do you think? My face looks Antagonist but my friends told me to buy it. So, this is the first time I wore it. For my readers, you can follow me if you want to and because you like my blog. If you don't like my blog, don't follow me. Amazing photos! Amazing shoes! i really like your blog by the way, followed you on bloglovin, maybe follow me back? great blog - lovely outfit! you look so pretty and fabulous dear... Btw i have same shoes..hahahaaa..maybe i will upload on my new post a few days later..
oh woooow, you look like a movie star, gorgeous! you look amazing dear! !i love your outfit from head to toe!thank you for your comment,i am your new follower would you like to follow me back? stunning doesn't even begin to describe your look. Wow, you look super stunning, i love the whole post! So Gothic and romantic! Amazing black outfit! Your shoes are super cute. I wish you was standing so I could see the whole outfit. Beautiful shoes and great look on you! Thanks for your support. Following your lovely blog now! It's an amazing post with so much inspiration. Love the pictures! I absolutely love the heels, they are gorgeous! Red lipstick looks good on you baby <3 and i do like ur blog have we followes each other? in love with those shoes. gold platform are fabuluos! gorgeous, love your blog. check out mine :) ? Fabulous! You look so beautiful<3 just found out your blog,mind to follow each other? Beautiful colors - very chic!